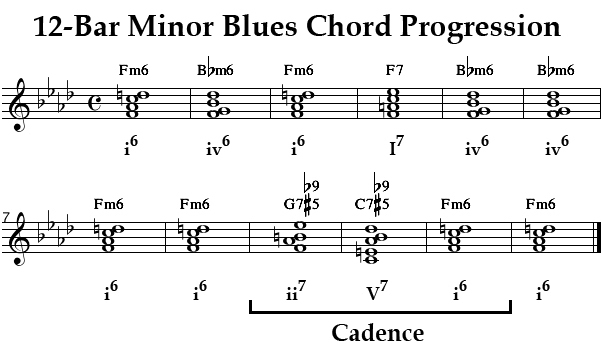 Another variation on the basic blues progression is the 12-Bar Minor Blues progression with the minor tonality in place of major. There are strong similarities to the standard 12-bar blues progression. 2. The 5th measure is the Subdominant (iv chord), or the chord based on the fourth step of the Tonic scale. 3. The 9th measure begins a cadence progressing to the Tonic (i chord).